Bob Willis and his Texas playboys performed thousands of shows across the U.S. For nearly six decades, recording prolifically during the 30's and 40's. They were a dance band with a country string section that played pop songs in a jazz style. Bob Willis was known as the King of Westen Swing. 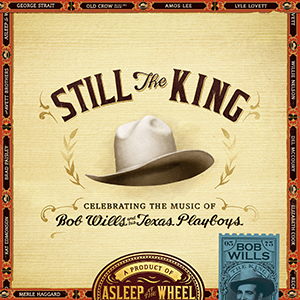 Now, Asleep at the wheel have brought together a large group of musicians to pay tribute to Bob Willis with an album of his songs. Collaborators involved range from their 20's through to a 92 year old. Well known names included here include Willie Nelson, Brad Paisley, Merle Haggard and Lyle Lovett. I'm guessing that not many of the people reading this review have ever listened to Western Swing - it's certainly not a well known genre of music in the UK, but don't let that put you off - it's always good to try something new. There is a dated feel to the music but it's a really enjoyable album to listen to with its mix of country, jazz and more. It's something that's hard to describe - really the only way to really understand what it's about is to listen to it.